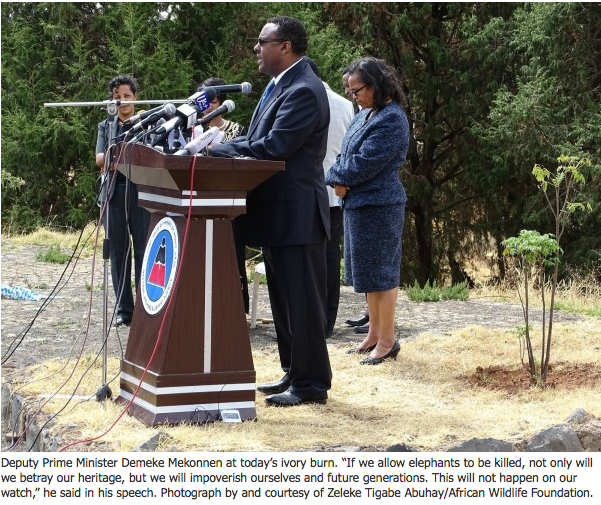 ADDIS ABABA, Ethiopia – At a ceremony today in the capital, Ethiopia burned its entire 6.1-ton ivory stockpile. The event was held at the Gulele Botanical Garden, close to the headquarters of the Ethiopian Wildlife Conservation Authority (EWCA), where the ivory had been stored. Deputy Prime Minister Demeke Mekonnen and officials from the Ministries of Culture and Tourism, the Ministry of Environment and Forests, and from Ethiopia’s Environmental Protection Authority attended, along with ambassadors and representatives from international and national environmental organizations. Ethiopia joins ten other governments that have destroyed all or part of their ivory stockpiles: Kenya (12 tons in 1989, 5 tons in 2011, 15 tons in March 2015); Zambia (9.5 tons in 1992); Gabon (4.8 tons in June 2012), the Philippines (5 tons in June 2013), the United States (6 tons in November 2013), China (6 tons in January 2014), France (3 tons in February 2014), Chad (1.1 tons in February 2014), and Belgium (1.5 tons in April 2014), and Hong Kong (29.6 tons in May 2014). Ethiopia is both a source and transit country for ivory. In 2014, 106 people were arrested in connection with ivory trafficking, nearly all of them Chinese transit passengers apprehended at Bole International Airport, in Addis Ababa. The country now has as few as 1,800 elephants, down 90 percent from the 1980s, according to Ethiopia’s National Ivory Action Plan. Fragmented populations are holding on in Babille Elephant Sanctuary (about 250), Gambella (about 340), Omo (about 410), Kafta-Shiraro (about 300), Chebera Chuchura (about 450), and Alatish and Geralle National Parks. Zeleke Tigabe Abuhay, manager of the African Wildlife Foundation’s (AWF) Simien Mountains landscape program in Ethiopia and former director of the Wildlife Development and Protection Department at EWCA, has followed developments closely. Since 2012, AWF has worked with EWCA to strengthen management and wildlife protection in and around some of the country’s premier protected areas. It is also currently training detection dogs for eventual deployment to Bole International Airport to help intercept ivory and other smuggled wildlife products. On March 19, Abuhay spoke to National Geographic about the pending ivory destruction. What led up to Ethiopia’s decision to destroy its entire stockpile? The momentum has been building for some time. Our neighbor Kenya just destroyed ivory, and we’ve seen other countries destroying all or part of their ivory stocks, showing their commitment to stop ivory trafficking. Last year, Ethiopia issued a National Ivory Action Plan, which shows the country’s attention to the elephant poaching crisis. It outlines intentions to conduct a review of laws and how to improve law enforcement efforts. The plan also shows a timeline for destroying ivory, which was supposed to happen by April of this year. We are also a signatory to CITES, and this move is in compliance with their requirements and recommendations to better combat illegal trade in wildlife. It gets the message out there that Ethiopia is serious about this issue and will hopefully discourage ivory traffickers from using our country as a transit hub. How will the ivory be destroyed? The ivory will be burned. I’m not sure how long this will take, but when it’s completed, there will be nothing left but ash. International media, conservation groups, government officials will all be in attendance and will be able to verify the complete destruction. Is illegal ivory a big problem in Ethiopia? Ethiopia is both a source and transit hub for smuggled ivory. We have a small population of elephants spread out in different sites, and though elephant poaching is not as big as in other countries, it has increased year to year here. Also, with a major international airport and Ethiopian Airlines, we’re connected increasingly to other parts of the world—other parts of Africa, Asia, Europe, and the U.S. So it’s perhaps easy to see why ivory is smuggled through Ethiopia. What are the main challenges in protecting Ethiopia’s elephants? There are many challenges protecting the populations along the borders with Sudan and South Sudan. Ethiopia’s wildlife authority has little capacity—training, human resources, lack of financial support—to protect all of the country’s 1,800 elephants, which is why it is working with conservation groups and others to strengthen management and protection in these protected areas, and also with different stakeholders like the customs authority and police to enforce laws. 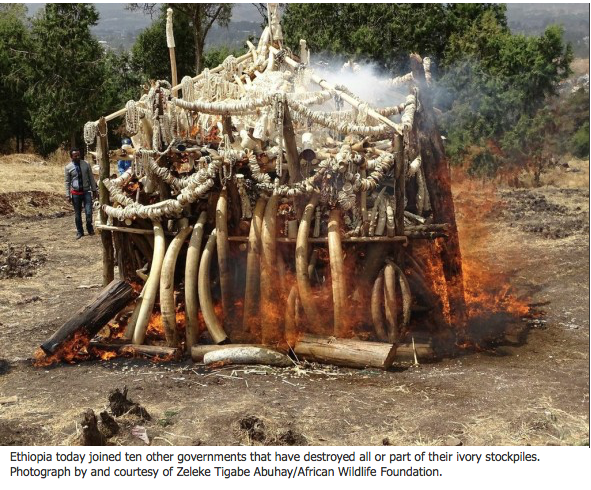 What steps is Ethiopia taking to reduce the illegal ivory trade? Ethiopia has developed an action plan to help guide efforts on the ground to combat ivory trafficking, which is the main problem. The government is reviewing its laws and making adjustments to the legal framework where needed. They are looking to increase penalties for those who contravene the country’s wildlife crime laws and want to ensure the judiciary is reinforcing the country’s new tough stance. This will require magistrate training, which groups like AWF and other partners can assist with. In time, this will serve as a deterrent to traffickers. There’s also a need to increase detection and interception of ivory with things like sniffer dogs, and we’re working with the wildlife authority to bring these to places like the airport.